It´s time for a new challenge at 7 Dots Studio! I hope you will find the time and join us - the inspiration circle this month is beautiful and the team really rocked the challenge again. This time theme of our challenge is “Traditions around the world” and what better month to talk about and create tradition orientated projects then December. There is so much celebration happening it has got to invoke some inspiration. 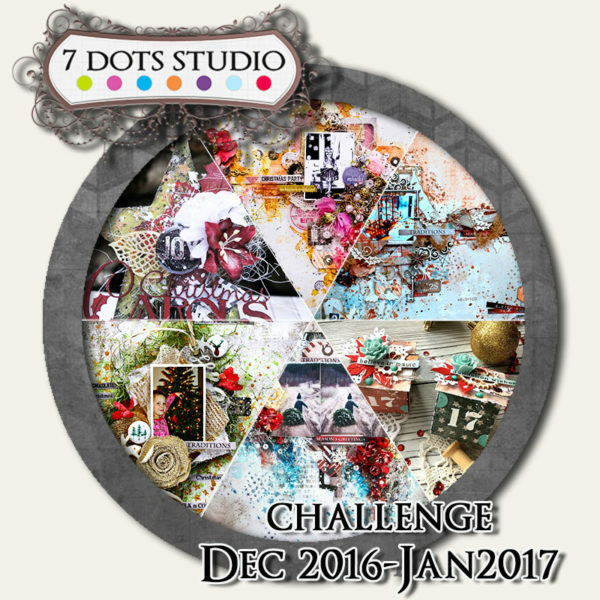 Is it a Christmas, New Years, Ester or any other maybe not so well known tradition we hope You can share your wonderful creations with us in this months challenge. I made two Christmas ornaments that now hang in our Christmas Tree! I thought for a long time about how I would tell the story about how we celebrate Christmas in Sweden. I finally decided to make a set of Christmas Tree decorations. The Christmas Tree is essential for all Swedish homes during Christmas, even though the look of the tree differs a lot (fake, real, blue, white, even pink…). We set up our tree 1 week before Christmas Eve and decorate it with a mix of vintage glass baubles and the kids creations. I made these mixed media stars with the Yuletide Collection as a base, and used stickers, die cuts and UmWowStudio flair. Please visit the 7 Dots Studio blog to view the entries from the rest of the Design Team.